Oh, how it is starting to feel like fall! The cicadas are making their last calls, the young cardinals are flitting around in the trees & the pumpkins are turning their bright autumn colors on the vines...time to turn our thoughts to Autumn decorating! 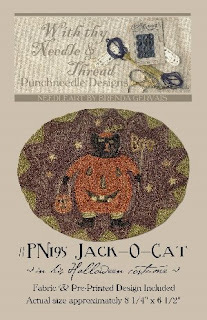 A fun cat who is all ready for October 31st....don't you love his pumpkin costume! A nice companion pattern to the "SPOOK" pattern. A spooky black cat all decked out in its pumpkin Halloween costume. 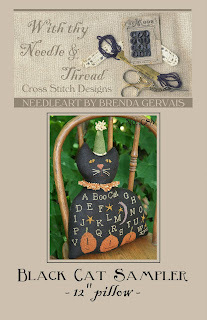 The piece is worked in great Halloween colors using the Valdani hand over-dyed flosses. This is a larger punch needle design but is worked with 6 strands so it goes together pretty quickly! Makes a nice little candle mat! The cornucopia is filled with the Thanksgiving turkey, pumpkins & bittersweet. Reminds us all to give thanks for thy bountiful harvest. Beautiful harvest colors are used in this piece...so rich in color! Piece is worked in 6 strands. Look who is up on the roof top....Claus & Co! 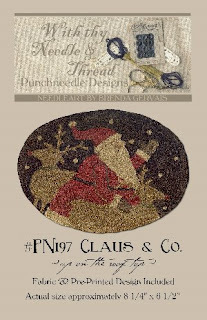 A whimsical Christmas punch needle pattern that is worked with the beautiful Valdani hand over-dyed flosses. This piece is worked with a medium needle tip using 6 strands of floss. 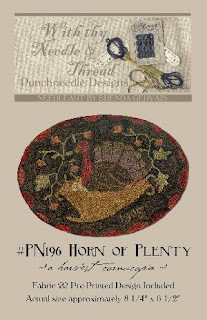 Here is a sneak peek at the NEW soon to be released cross stitch patterns from With thy Needle & Thread!! BLACK CAT SAMPLER pillow is worked on 30 count black hand dyed linen over 2 threads. A great little accent pillow to place on an old chair or even in amongst some fresh pumpkins for a great Autumn display. A teensy tiny little pineapple that measures just 5" tall. Simple motifs are worked on 25 count flax linen over 1 thread. 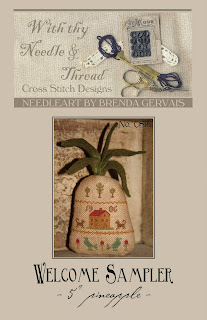 The piece is then simply sewn into a pineapple shape & stuffed. Wool felt leaves add great texture & detail to this piece. The pineapple has long been the symbol of hospitality...what a great little piece to welcome your family & friends. A quick & easy pattern! 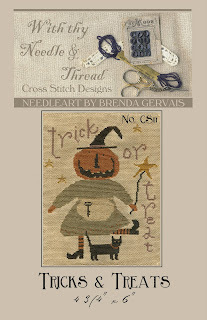 TRICKS & TREATS is worked on 22 count Fine Ariosa over 1 thread. 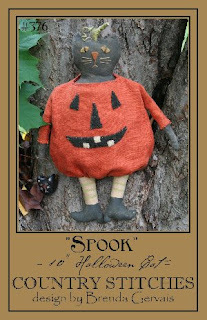 A whimsical pumpkin headed witch that would look great framed or sewn into a small cupboard hanger.